Rev. 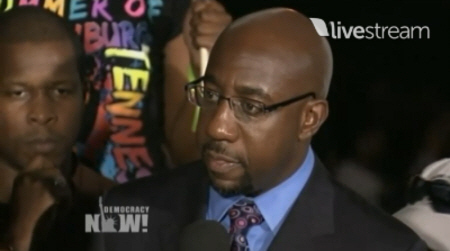 Raphael Warnock talks with Amy Goodman of Democracy Now during livestream broadcast. After many people had made their peace with the idea of Georgia death-row inmate Troy Anthony Davis’ life ending at 7 p.m. on September 21, 2011, the U.S. Supreme Courts just after 7 p.m. issued a call for a “temporary delay” of his death, but then again at 10:20 said it would not block the execution. Officials then announced that Davis was executed at 11:08 p.m. The planned execution of Davis for the 1989 murder of police officer Mark Allen MacPhail topped news broadcasts on every major American television station Wednesday. 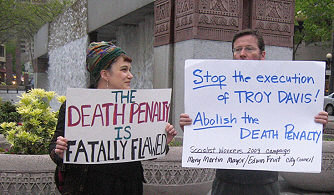 Protests against the execution were staged globally in cities from Oslo and Paris to New York and Atlanta. The online television and radio program Democracy Now had scheduled a live stream broadcast from outside the Georgia Diagnostic and Classification Prison at Jackson, where Davis was executed, to last from 6 p.m. to 8 p.m. The broadcast instead, with host Amy Goodman, lasted for four hours beyond that scheduled time. Savannah Talks Troy Anthony Davis No. 16: Davis Executed | Aberjhani | Blog Post | Red Room. Neither petitions bearing the names of almost one million people nor requests from such high-profile figures as former U.S. President Jimmy Carter and Pope Benedict XVI convinced the Georgia State Board of Pardons and Paroles to cancel the execution of Troy Anthony Davis scheduled to take place September 21. 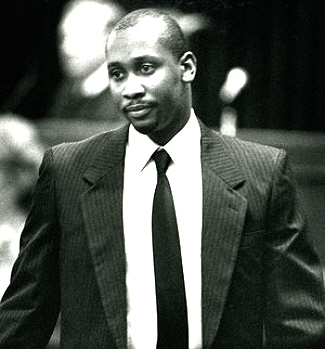 With the Board presenting its announcement just one day before the planned execution, it appears that the two-decade-long struggle to free Troy Anthony Davis, following his conviction for the 1989 murder of Savannah police officer Mark Allen MacPhail, may soon come to an end. The Board listened to hours of testimony from Davis’ supporters and prosecutors before choosing to reject his appeal for clemency. The inmate’s case over the past twenty years has created a forum for debates over the constitutionality of the death penalty and raised many questions about effectiveness and fair practices where the American judicial systems is concerned. It has also forced the families of the slain Officer MacPhail and the imprisoned Davis to live with the ongoing pain generated by of a lack of closure. Savannah Talks Troy Anthony Davis No. 15: Georgia Board Denies Clemency | Aberjhani | Blog Post | Red Room. Savannah Talks Troy Anthony Davis No. 14: Death Order Signed | Aberjhani | Blog Post | Red Room. 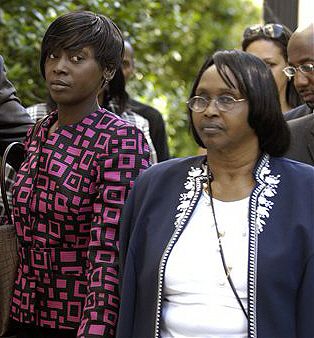 Martina Davis-Correia (left) with the late Virginia Davis, sister and mother (respectively) of Georgia death-row inmate Troy Anthony Davis. Please click link above for story. 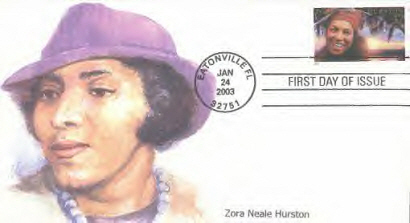 Post card with image of the great Harlem Renaissance author Zora Neale Hurston. The celebration of major historic milestones is a favorite pastime in pretty much every culture. This year, 2011, in the United States many are commemorating the 150th Anniversary of the American Civil War. That means four years from now numerous festivities will take place to observe the same anniversary for Jubilee Day, or the liberation of America’s slaves. In addition, countries around the world are currently honoring the first United Nations-declared International Year for People of African Descent. Flip the calendar forward by almost a decade and we find ourselves approaching another major milestone: the 100th anniversary of the beginning of the Harlem Renaissance. The past couple of years have already seen celebrations of the centennials of the National Association for the Advancement of Colored People (NAACP) and the National Urban League. Both organizations during the Harlem Renaissance played key roles–– as advocates for racial equality and as publishers of influential magazines that featured prize-winning works by now major authors like Dorothy West, Jean Toomer, and Zora Neale Hurston. Exactly When did the Harlem Renaissance Start? For proposed answers to the above question please click here . Having attempted to obtain his freedom for more than twenty years, Georgia death-row inmate Troy Anthony Davis may have lost his final chance when on March 28, 2011, the U.S. Supreme Court ruled that it would neither review Davis’s requested appeal itself nor order the Federal Appeals Court in Atlanta to do so. Davis and supporters have been battling for his freedom since he was convicted and sentenced to death for the 1989 murder of off-duty police officer Mark Allen MacPhail in Savannah. He has been scheduled to be put to death three times but each time obtained a stay of execution pending further investigation into his case. Davis had long contended that a review of new evidence would establish his innocence, and when seven out of nine witnesses recanted their testimonies against him, it appeared the legal tide might eventually turn in his favor. However, although the Supreme Court did order an evidentiary hearing held for Davis last summer, Judge William T. Moore ruled in the hearing that revised statements and the proposed new evidence were not sufficient to confirm Davis’s innocence. He publicly chided Davis’s defense team for their handling of the case even as he himself acknowledged that as yet some doubt did remain regarding the likelihood of Davis’s guilt. While Davis’s family and supporters have understandably been fighting for his release, the family members of slain Officer MacPhail have expressed their belief that Davis is guilty and have rallied for his execution. That “passed buck” now sits in the hands of the Georgia Board of Pardons and Paroles, a five-member board known to almost never postpone executions. At this point, Georgia state officials are basically free to move ahead with Davis’s execution. Ironically enough, earlier in March federal regulators seized the state’s supply of the drug sodium thiopental, which is one of the key drugs used to administer lethal injections. Doubts have been raised about how the state obtained its supply of the drug and consequently all executions in Georgia have been placed on hold. This is the twelfth installment of Aberjhani’s Savannah Talks Troy Anthony Davis Series. For part one, please click here . To make sure you catch future installments, please sign up for a free subscription. Savannah Talks Troy Anthony Davis No. 11: Judge Moore says “Not innocent” – National African-American Art.